From collisions by bicycles with automobiles, there are approximately 700 Deaths per year in the United States. These deaths here are just a statistic; but to those 700 people, their friends, family, and community, each year these deaths, are a devastating blow that will leave a mark for the rest of their lives. For over the past 25 years this brings the total deaths to 18,000 people. It can be scary to ride on the road–but in 24 states (5/16/2016) there is a law that mandates a 3 foot buffer between a bicyclist and the automobile that is ‘Overtaking’ the bicyclist. In Arizona, violation is a civil penalty (see this link for Arizona Statute ARS §28-735). Heres the kicker…. You ready for this? …. I sure as hell nearly fell off my seat…. Death to another person, the violator is subject to a civil penalty of up to one thousand dollars. I’m not a legal expert but that reads like its only $1,000 to perform vehicular homicide! And, as the Arizona statues reads, those punitive damages do not apply when there is a bicycle lane or path or the person is riding against traffic. 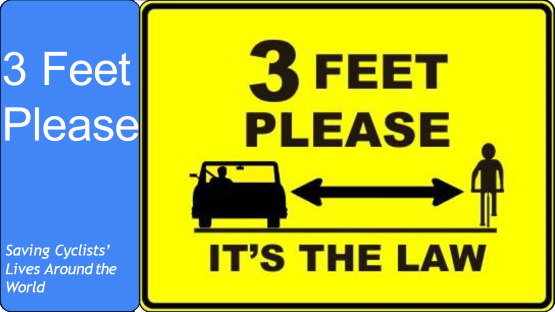 So, TBAG has started a new partnership with 3 Feet Please, and Arizona advocates: Denise Johnson <denise@biketempe.org>, Stevie Milne <stevie@biketempe.org>. Please contact these advocates if you’d like to get involved. Previous PostPrevious Thank you for a successful 2015 Tour da Fat!